A member of the comfortable and distinguished Alexandria Collection from Meadowcraft, this outdoor chaise lounge offers a transitional style that blends traditional wrought iron with modern curves and scrolls. Meadowcraft focused on both the design and the seating experience when creating this chaise lounge. The cushions are plush and comfortable and come in your choice of fabric (see link below) while the iron-mesh and scrolls found in the arms and ears add a distinguished appearance. 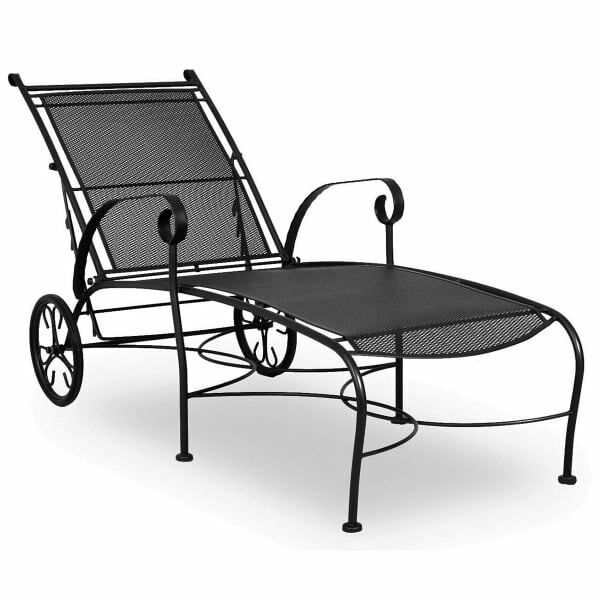 And while wrought iron in the past could deteriorate and rust after a few summers, this chaise in subjected to a baked-on powder-coating process that virtually erases these negative aspects of traditional wrought iron, providing you with a chaise lounge that will last even if it's forgotten outside in the elements. Frame Finishes: Charcoal, Chocolate, Bronze, and Canyon Spice.